Ack, another day where I forgot my camera. This photo is actually from nearly a year ago, when I went for a yoga retreat in Xiangshan (the Fragrant Hills). 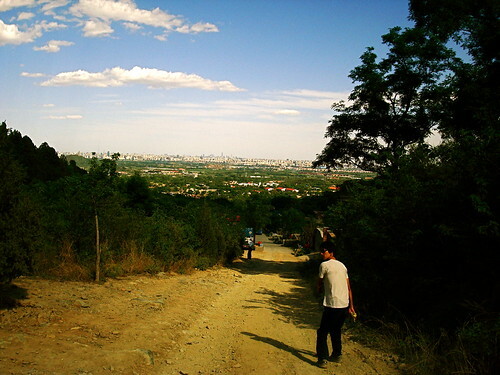 The view of Beijing from Xiangshan, as you can see here, was amazing. The guy in the photo was a model of responsible environmentalism; he saw some trash on the ground when we were walking around looking for a temple, and–this is the impressive part–he picked it up to later dispose of it properly. This was not a day where I forgot my camera, but I didn’t leave my house all day on account of a total lack of interest in doing so. Oh well. Next time I shall take a photo of the inevitable baking/cooking project that is undertaken on these stay-at-home days. 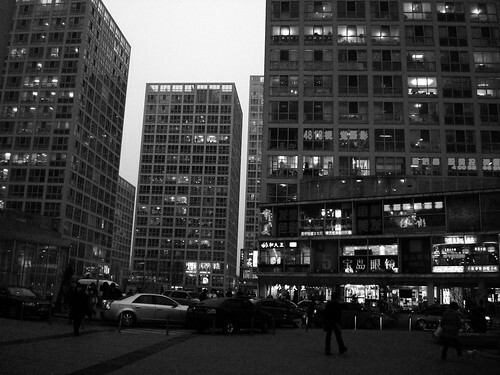 A photo of the Jianwai Soho complex at dusk, from a day when I actually did go out. Back in action with camera in tow. 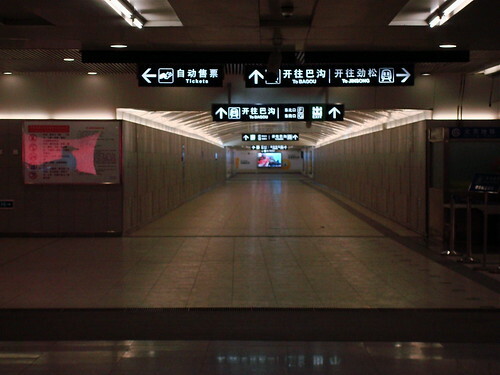 Beijing is so crowded that when it isn’t filled with people, it’s rather eerie. 4 Comments on "One A Day Photo Project: April 8th – April 10th"
Your blog makes not living in Beijing anymore a little more bearable, the homesickness a bit less acute. It’s also such a motivation to keep studying so I can go back asap. Thank you! Thank you Linnéa. It’s great to hear that you are enjoying the blog! Good luck in your studies! Love your blog…so fun and beautiful!